What inspires you in your workouts? For many people, music is just as important to their fitness routine as the right shoes, equipment, or clothing. 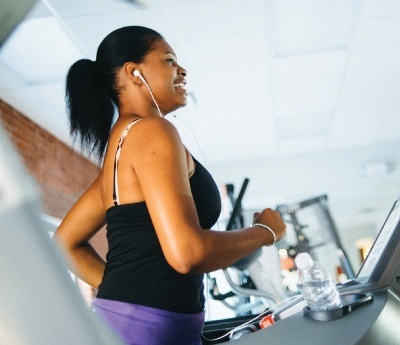 These people aren’t just listening to their favorite tunes as they push through one more set or stride through one more mile; music is actually enhancing and improving their physical performance, too. 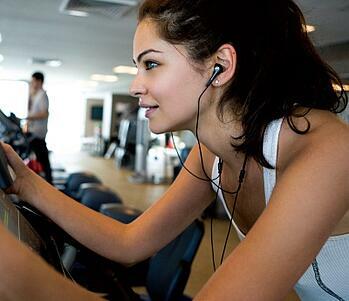 Researchers have found that music increases exercise endurance by 15% and helps exercisers to feel more positive. How does the right song improve your performance? When you listen to a song while exercising, your body may make adjustments to keep in time with music, helping you to maintain a steady pace through your workout. And listening to music can offer a welcome distraction that actually helps your workout. After a certain period of exercise, fatigue can set in. When you body recognizes the signs of exertion, such as rising levels of lactate in the muscles or increased sweat production, your brain will start to send feedback that it needs a break. Music can compete with this mental process and allow you to keep pushing. Ready to experience the benefits of music to your workout? The music that you prefer to listen to while driving through traffic or relaxing in your home may not necessarily be the music that you want to motivate you through your workout. Two of the most important qualities of workout music are tempo (speed), and “rhythm response,” which is how much a song inspires you to move. When a song is playing, you may naturally find yourself nodding your head, tapping your toes, or even wiggling your fingers along with the beat. This response to rhythm can vary from person to person, but fast songs with strong beats tend to stimulate this response in most people. What does that mean for your playlist? Psychologists suggest that most people have an innate preference for songs with a rhythm of 120 beats per minute. The music that usually fits that tempo is typically pop, rock, and hip-hop. It’s not just the background beats that appeal to people at this tempo. Some exercisers like to workout to rap songs with lyrics that are spoken at an upbeat tempo, even if the background music is slower. The perfect workout songs will not only physically inspire your body to keep up with the tempo, it will also inspire and uplift your emotions. Researchers have found that music can change the way you respond to fatigue by elevating your mood, and that strongly identifying with a singer’s emotions or perspective makes a song even more motivational. Here are some of the biggest hits from the summer of 2015 to get you going, as well as some tried-and-true favorites that continue to inspire exercisers with their beats and motivating lyrics. Let’s be honest, when Kelly sings “What doesn’t kill you makes you stronger, stronger” or when Katy belts out “I got the eye of the tiger, a fighter” the urge to push a little harder, a little faster, and go a little longer is hard to beat.